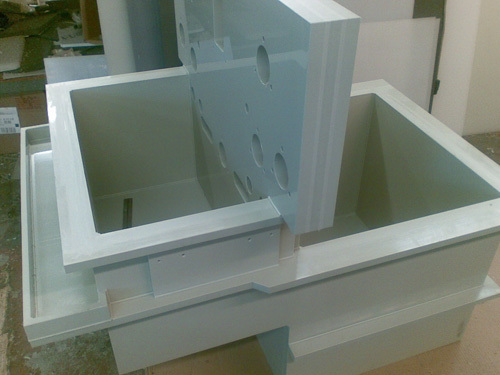 At ARC Plasmet Corp. we offer a wide range of plastic processing services. This project, the fabrication of a custom tank for the chemical industry application, highlights our plastic machining capabilities. A Fadal CNC milling machine was utilized to precisely manufacture the tank parts. The fabrication process also required saw cutting, welding, and assembly to complete the complex customer specifications. Four finished tanks were ultimately fabricated in the quick timeframe of 2 weeks for this New Jersey customer. The final measurements of the tanks were 4' in length, 3' in width, and 2.5' in height and was machined from euro gray polypropylene with a thickness of .75". Dimensional and visual inspections were conducted to ensure manufactured tolerances of ±.005". For more information on this project or the processes used to manufacture it, see the table below or contact us directly.